Westgate Street, Bury St Edmunds. One of the oldest and smallest working theatres in the country, the Theatre Royal is a delightful Georgian building owned by the National Trust. It enjoys a reputation for high quality drama, opera, musicals, concerts and comedy. You can obtain a programme by ringing the Theatre, and you are welcome to look around free of charge between 10am and 8pm from Monday to Saturday, rehearsals and performances permitting. 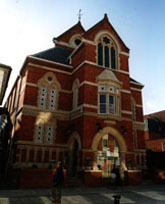 Town Hall Arts Centre, High Street, Haverhill. A magnificent Victorian Hall built in 1883 by the Gurteen family and recently refurbished to include facilities for theatre, film, dance, crafts, meetings and exhibitions. Call for a full programme, or drop in. Cafe and bar available.